Gary Dyck writes entertaining personal anecdotes for the whole family. 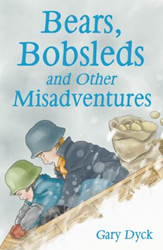 Within the pages of Gary Dyck’s new book, Bears, Bobsleds, and Other Misadventures, ($14.49, paperback, 9781545608371; $6.99, e-book, 9781545608388) readers will find clean, Christian, Canadian humor about the author’s childhood in Canada and marriage to an American woman. The wacky characters, crazy situations, and self-inflicted misadventures will keep readers in stitches. Gary Dyck is a Canadian-born university graduate who worked many years as a communications advisor for municipal government. His previous work is Miracles: Your Impossible Is Possible. Xulon Press, a division of Salem Media Group, is the world’s largest Christian self-publisher, with more than 12,000 titles published to date. Retailers may order Bears, Bobsleds, and Other Misadventures through Ingram Book Company and/or Spring Arbor Book Distributors. The book is available online through xulonpress.com/bookstore, amazon.com, and barnesandnoble.com.